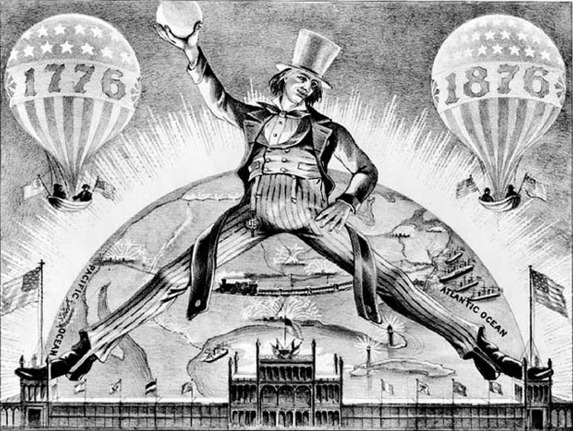 In 1876. the United States marked its centennial (or one hundredth birthday) with a World's Fair held in Philadelpha. The fair celebrated American technological progress and expansion. In this print, created by Currier & Ives, "Brother Jonathan" (a symbol of the nation who came before Uncle Sam) straddles the towers of the main building at the Philadelphia World's fair. Currier & Ives produced and sold lithograph illustrations of events, portraits, and scenes from American life. Source | The Stride of a Century, lithograph (New York: Currier & Ives, c. 1876); from Library of Congress, Prints and Photographs Division, http://hdl.loc.gov/loc.pnp/cph.3c06472. Cite This document | Currier & Ives, “The Stride of a Century,” HERB: Resources for Teachers, accessed April 22, 2019, https://herb.ashp.cuny.edu/items/show/1174.